"If the tables were turned, and the Iraqis invaded Arkansas, it'd probably be the same." 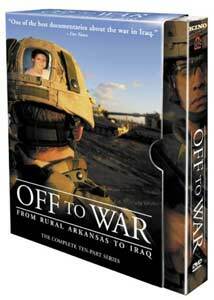 Off to War takes us from rural Arkansas to the heart of the war in Iraq as we follow a national guard unit deployed to Camp Taji just outside of Baghdad. It's an essential behind-the-scenes look at the lives of soldiers serving in the Middle East, and at the lives of the families that they leave behind. It's occasionally inspiring, but mostly harrowing and completely essential viewing for anyone who feels strongly about the war in any regard. I would have expected guardsmen from the rural south to have been more rah-rah going in, but the conflict was in its second year as this begins, and cynicism had already started to settle, particularly among the families of the men. The feelings of the guardsmen themselves cover the spectrum. They're proud, but some are thrilled about the adventure and the chance to leave Clarksville, while others make it known that this isn't what they signed up for. One will be leaving behind a successful career as a salesman. Another will leave his turkey farm in the care of his wife and young children. Still another will leave behind a ministry in its infancy. Some of them will have jobs when they return a year or 18 months later, but others know that they'll be starting almost from scratch. It's not just the soldiers; wives have to radically alter their lives as well, quitting jobs or learning to live as single parents for the first time. War is traumatic, but preparing to go is equally so for these families. I can't begin to imagine being left behind by the one closest to me for at least a year, knowing that at any moment the call could come letting me know that I'll never see them again. The first few episodes of this series really bring that feeling home in a way that I couldn't have imagined. These national guardsmen never expected to be called up to serve extended tours in another country, and the price they pay for volunteering to serve starts to seem mighty high. Right away they encounter all of the things they'd heard about on the news: we watch them scrounge for armor in the dire conditions of Baghdad amid the constant insurgent attacks. Meanwhile, back at home, it's not easy to get benefits payments, even in the case of a grievous and gruesome injury that one of the guardsmen receives. This isn't a political film, though. Directors Brent and Craig Renaud follow these families for the duration of the tour without interjecting their own point of view. I ws surprised when I realized that, despite years of news, I had no idea what Baghdad actually looked like. I'm kind of a news junkie, but I still had absolutely no picture in my mind of Iraq beyond a few seconds of footage here and there. The Renaud Brothers are to be commended, among other things, for bringing home the physical reality of Iraq. There doesn't seem to be much artifice at play in this series. It is, after all, a reality show, albeit one very different from something like Big Brother. In a more traditional documentary, the skill would be in the filmmaking, while here it's largely in the editing. The camera follows these soldiers and their families around in ways that feel quite real. I never felt like I was being manipulated, and the main point of view always felt like that of the soldiers and their loved ones. We share in their triumphs as well as tragedies, and all of the small moments that make life livable. It's certainly not all horrible; much of it is just people living their lives and it's certainly interesting to see much more of Iraq than we get from the evening news. Make no mistake, though: you'd have to be pretty jaded to not find this series incredibly difficult to watch in places. That's a compliment. The guardsmen are in constant danger, and they don't all come home. The wives and kids and parents somehow live with that possibility. By episode three one of the men that you've come to care about suffers a horrible injury and others are placed in very real danger: even the trailers that the guardsmen sleep in aren't safe from mortar fire. Things only get worse from there. They're all living an absolute nightmare. For anyone with strong feelings about the war, this is highly recommended viewing. It's skillfully enough made to be entertaining while at the same time making absolutely plain the price that is being paid. Image Transfer Review: The series is presented in its original television format, with some but very little pixelation. The quality of the original footage varies somewhat, but is represented well here. Colors are deep and clear, and on the whole it looks quite good. Audio Transfer Review: There's a very basic Dolby 2.0 track. Everything is audible, clear, and balanced. Extras Review: Kino has provided a nice assortment of extras to flesh out some of the material in the main documentary. There are four commentary tracks, one per disc, featuring the episode directors as well as soldiers. They are largely personal reminiscences. You come to care so much about these people that it's interesting to hear what they have to say about the series itself. The Soldiers' Photo Album is a still feature with images captured and captioned by various soldiers from the series. There are 19 extra scenes, which aren't really essential, but worthwhile nonetheless. I imagine that they were cut more for reasons of pacing than for any concerns with quality. Memorial Film is tough: it's a very brief remembrance of the 33 members of the brigade that have been killed. Trailers for the series are included, as well as text-only cast and crew bios. This 10-hour series is a harrowing behind-the-scenes look into the lives of national guardsmen in Iraq and the families they leave behind. Kino has provided a fairly generous collection of extras that provides even further insight. This is a well-produced series that provides a far better look at the war and its impact on families than anything you'll see in the news.